Every now and then a show comes along which looks like it’s going to be a heartwarming delight and turns out to be a salacious festival of naughtiness. This one’s the other way ’round. 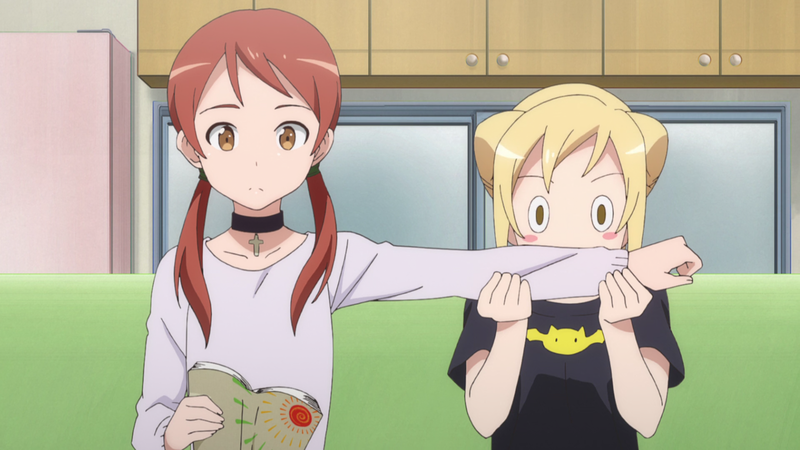 Interviews With Monster Girls is a 13-episode anime based on an ongoing manga series. The stories about strange humanoid monsters are real! Well. Kind of. Some of them. A bit. Maybe not the way you expect. And one man wants more than anything else to know everything that he can learn about “demi-humans.” Lucky guy: Several of these “demis” show up at the school where he teaches! Hilarity ensues. Pardon me miss, are you related to Ichabod Crane perchance? The characters are each fun in their own way, and each achieves some kind of emotional growth over the course of the series. Interviews also plays with viewer expectations in some interesting ways. 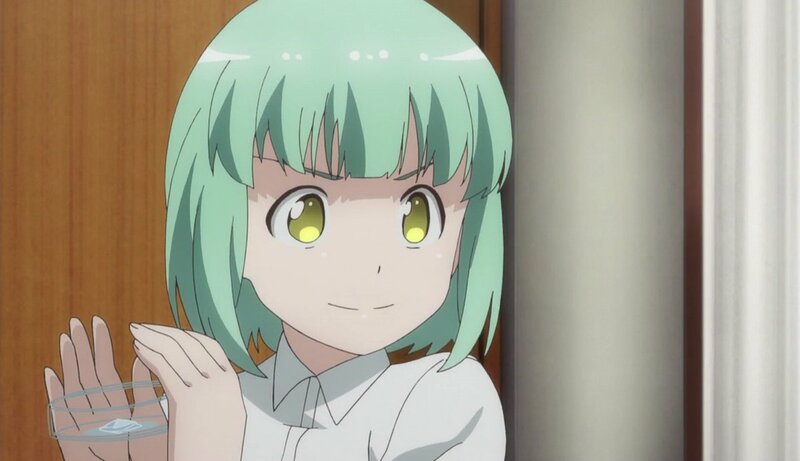 It being anime, there being cute girls, you assume naughty hi-jinks of some sort will take place. And yet, every time it looks like they’re going to take something in that direction, they find a way to “nope!” back away from it, usually in tongue-in-cheek fashion. Trust me, it works better than I’m making it sound like it should. 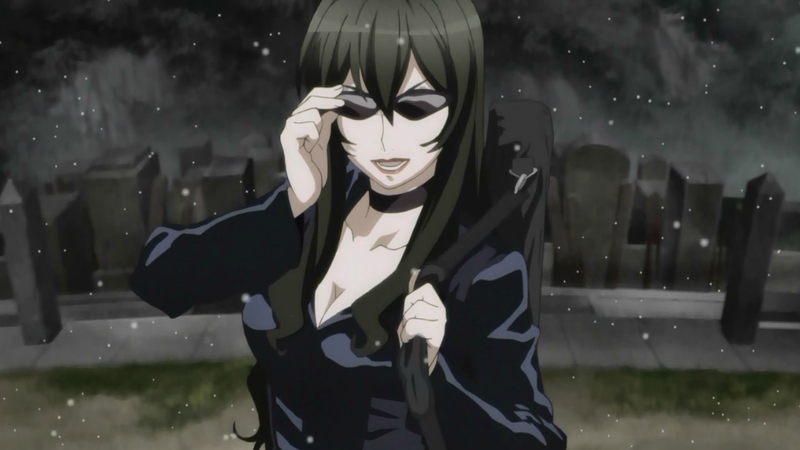 The succubus is a teacher, thankfully, not a student. 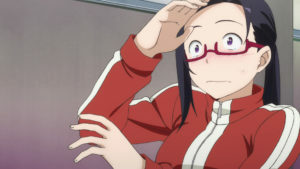 Another fun aspect is that our demi-obsessed teacher tries to apply logic and reasoning to the myths and legends surrounding the “monsters,” such as what effect sunlight and garlic really have on the vampire girl, how much of the snow fairy’s scary reputation is based on confirmation bias, and so on. You can’t really take this as a serious exploration of the subject, of course. It’s just that this approach helps sell the teacher/student relationships as staying within the bounds of professionalism more than one would originally have expected from this kind of setup. The jokes and dialog sometimes verge on the squicky. They usually avoid going too far, as noted above, but in order to achieve the “nope!” they have to veer toward the naughty enough to sell it. It’s an odd technique and your mileage, of course, may vary. I’m not actually giving away what all makes this scene so laugh-out-loud funny. Trust me. 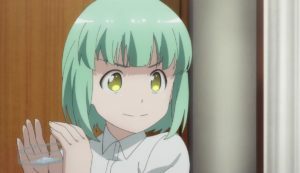 There’s an interesting little plot beat late in the show where someone in the school’s administration starts to ask, much as a viewer might, “Is this actually appropriate behavior for a teacher?” And it’s handled… remarkably well actually. It doesn’t turn the show dark, nor is it overly saccharine. Sometimes what you need is a warm fuzzy. Well, they don’t get much fuzzier than this, do they? A family moves out to the countryside. While there, the young daughters meet magical creatures. Or do they? It’s hard to tell which of these two is more startled. 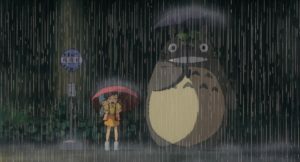 Totoro is just a feel-good, warm-fuzzy, adorable work of art. The soot sprites are cute. 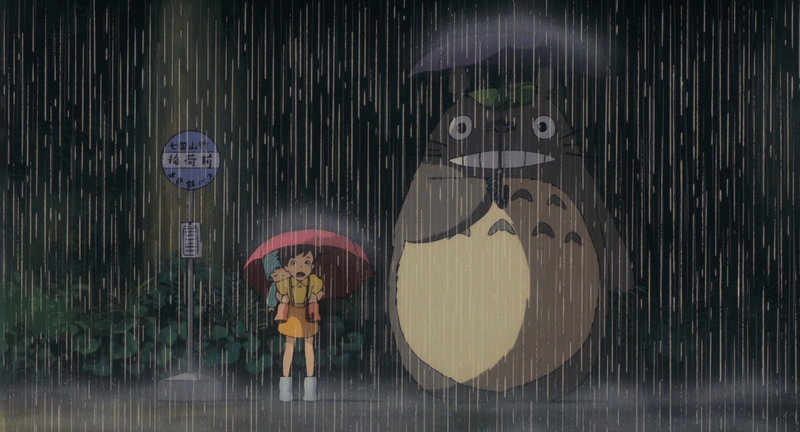 The various Totoro creatures are cute, even the big occasionally-loud one. 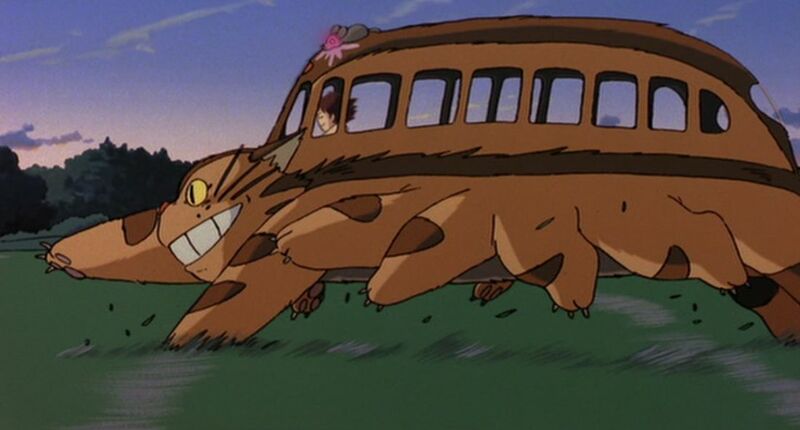 The catbus is a joy to behold. I’m a grown up adult type person and I still want a ride in one of these. After a full dose of allergy meds, mind you. Idyllic scenery and quiet pursuits pervade the film. It’s beautiful and soothing and delightful. To say that it’s leisurely in pace is to put it mildly, and there’s very little resembling high drama. For some, these are selling points. For others, maybe not so much. Thrill as a family snacks on fresh vegetables! Due to circumstances, the version I’m most familiar with is the Streamline dub. 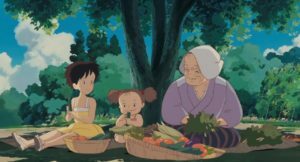 I’m not sure if I ever got around to checking out the later Disney dub. Funny, that. This scene alone has spawned more homages and parodies than I can count. No surprise, Disney considered, it’s not available for streaming so you’ll have to pick up a shiny-platter edition. Do it on the cheap if you must, but I recommend having a copy in your library. You never know when you’ll need something cozy like this to enjoy. 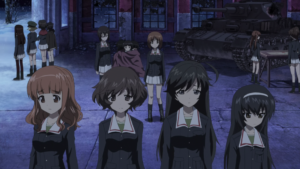 Girls und Panzer is a 12 episode anime series (if you don’t count two “recaps”, the follow-up OVA, the short “special episodes” on the DVD/Blu-Rays…) from the Winter 2012 season. It spawned various adaptations and follow-ups, and the property has been used to promote a tank-battle video game. A girl who thought she’d left tank-battling behind transfers to a new school and gets caught up in the tank-battling scene. Competitions, high morale, low morale, and succeeding despite the odds ensues. Cheer up, girls! I’m sure you’ll win! Even if you don’t watch much anime you’re probably familiar with the general arc of the plot. A group of plucky, oddball underdogs faces a series of competitive challenges, yadda yadda. The fact that it’s been done before doesn’t mean it can’t be entertaining. It’s not the trope, it’s how the writers wrangle it, after all. 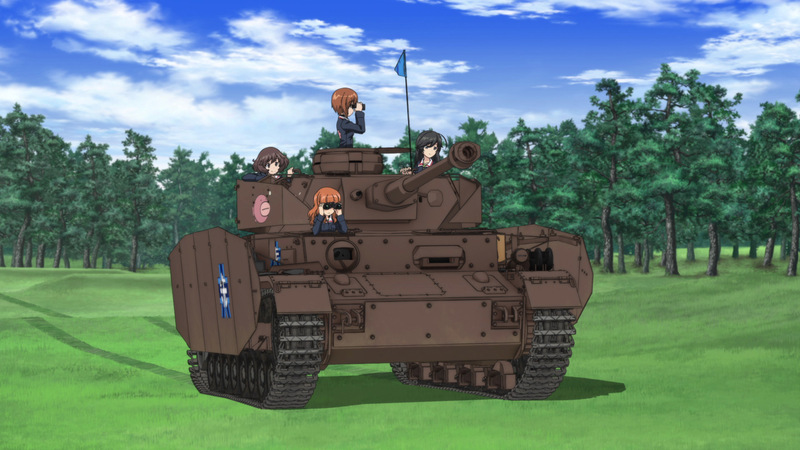 There’s this weird blend of the comfortable well-worn narrative tropes that you can relax into and the utterly bonkers idea that schoolgirls are engaging in competitive tank battles. I mean, seriously. 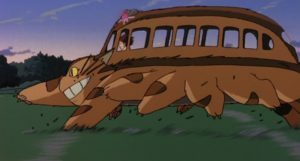 This is one of the silliest show concepts in my list for the year, and remember that I’ve already written about Ouran High School Host Club and Gundam Wing: Endless Waltz, and I haven’t yet gotten to Gr… er, never mind. Ahem. Look. Either you see this picture and think “WTF, I MUST watch this show” or “WTF, NO.” No middle ground allowed. I can’t help but cheer for the home team. They’re smart, they’re quirky, they’re motivated, and they’re cute. The tactical matches are reasonably well thought-out as well (at least to this layman’s eyes) so it’s intellectually engaging enough on that level to add to the entertainment value. Unless the very concept itself is off-putting, or maybe if an all-girl cast is a problem to you, there shouldn’t be too much to offend anyone’s delicate sensibilities here. Maybe just a general “not my cup of tea,” I suppose. And yes, you must suspend a lot of disbelief. 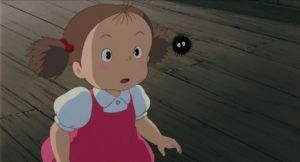 This is anime, remember? Par for the course. When a show is built around a young female character, often you end up with the “spunky but inept” archetype. They don’t quite go that route in this show, and in fact what we get is someone with competence but not confidence. 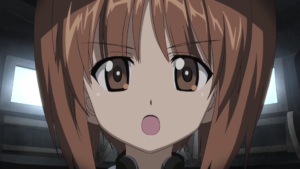 Miho has a bit of a tragic backstory, at the risk of overstating the situation. Overcoming that while forging her tank crew into a cohesive fighting unit is the arc of her progress in the series. I find this interesting because usually it’s the male leads who have “something dark in their past” and so forth. The worldbuilding is kind of ridiculous but also quite adorable. 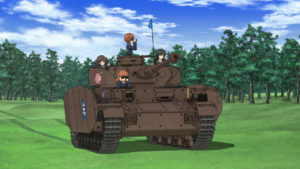 In an early episode, the girls drive a tank through town along residential streets, and folks lean out of their windows to “ooh” and “ahh” over the tank and to wish the girls luck, like this was nothing particularly unusual. You just have to kind of roll with it. You will probably learn more than you ever wanted to know about various tanks, by the way. 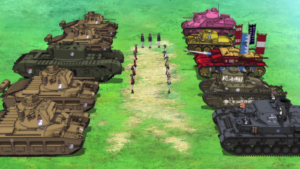 One of the selling points of the show was the realistic CGI tank models. 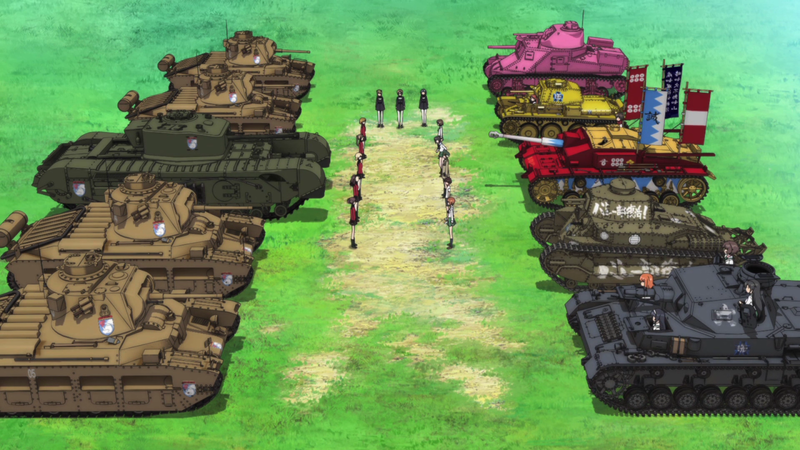 Once again, Crunchyroll has your schoolgirl team competitive tank action on tap. 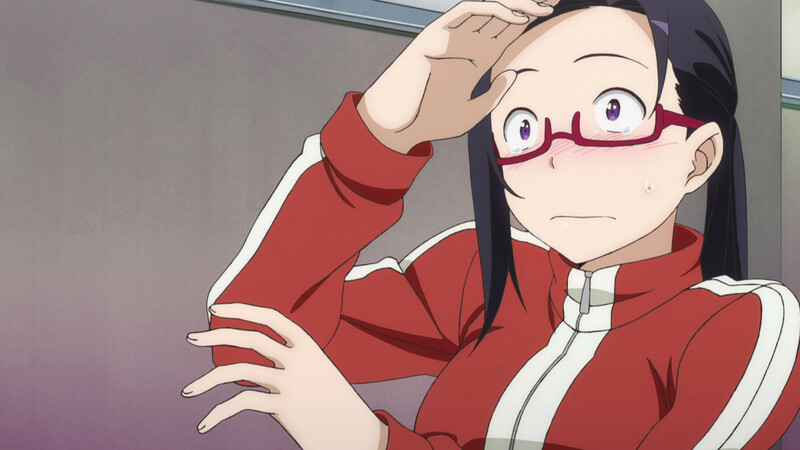 If there’s one thing anime loves to do, it’s to cram two ideas together at particle-accelerator speeds to see what kind of shiny explosion results. This week’s selection crams two related things together, then crams the resulting mass into yet more things. 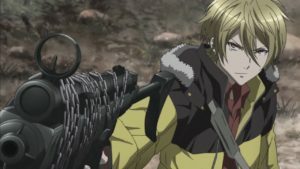 Blast of Tempest is a 24-episode anime based on a manga series. It’s kind of… Hamlet meets The Tempest. Meets vague Biblical references. Meets a magical action combat show. It’s kind of… an out-for-revenge plot meets a murder mystery meets some kids trying to prevent the end of the world. This show is action combat fluff with great characters and some clever ideas. Everything else is just gravy at that point. I’m not saying that any of the characters are role models or particularly nice. I don’t want to hang out with them, I certainly don’t want to emulate them, but I like watching them interact with one another and blow stuff up. You will never be as cool as Evangeline Yamamoto. Just accept that fact. Also, people quote Hamlet from time to time. They got me right in my weak spot, there. 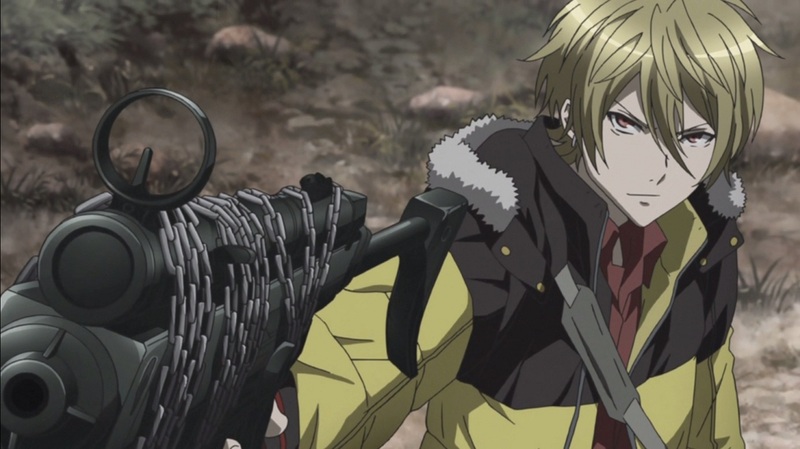 Unlike my usual preferred fare, Blast of Tempest is a bit on the grimdark side. Bad things happen to good people. 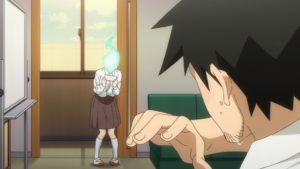 Heck, the plot largely pivots on a mysterious dead girl’s circumstances. This is disturbing, yes, but not as disturbing as the plot-centered dead girl. Trust me. I’m a bit slow. Despite “tempest” right there in the name, despite the Hamlet quotes, I didn’t really put together what was going on until reading up on the show later. Gods, I hope CrunchyRoll never goes out of business, or I’ll have to edit so many entries in this feature. 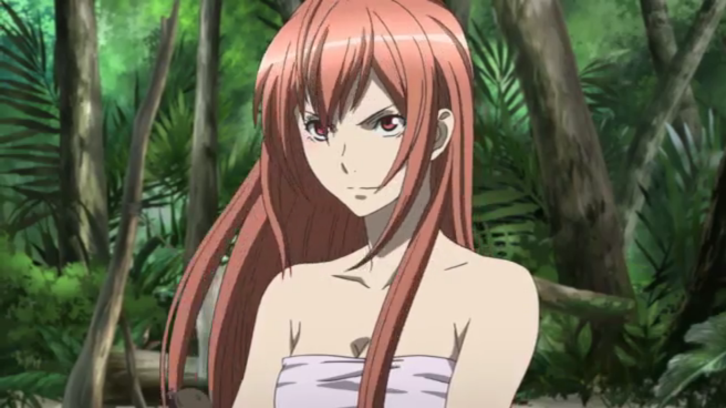 In the meantime, have some streaming Blast of Tempest.